Join the fun Saturday, October 28, starting at 8 pm! ‘Nightmare at Signaturez’ Adults Only Halloween Costume Party will take place at Signaturez Restaurant, 224 S Main Street, in Yazoo City! 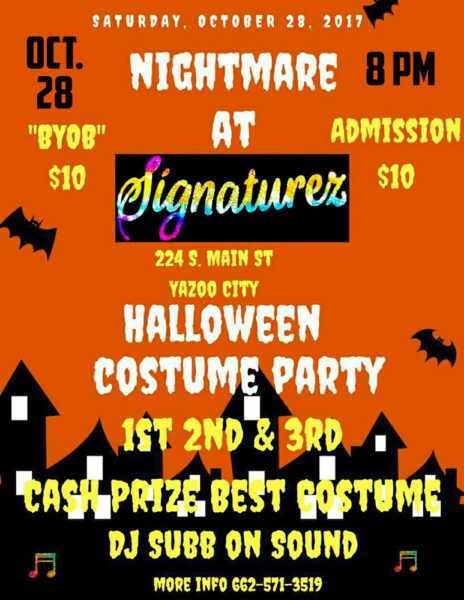 1st, 2nd, and 3rd place prizes will be awarded for best costume! Sound by DJ Subb! $10 Admission. For more information call 662-571-3519.